Heard about the “digital CFO?” Of course you have. Hot on consultants’ lips and dripping from every whitepaper aimed at a corporate finance audience, the term “digital CFO” is supposed to foretell an era in which finance chiefs finally harness the power of promising digital tools and transform the enterprise. Armed with these tools, posit the “experts,” CFOs will become true enterprise-wide strategists and leaders of innovation, utilizing technology to both scan the bigger picture and quickly respond to real-time business changes. Would that it were as easy as vendors and consultants claim. The truth is the digital transformation of both the finance function and the enterprise occurs in fits and starts, hampered by the obstacles to implementing new, imperfect systems and by the people doing the implementing. That notion might be disappointing to the salespeople and marketers hawking the latest must-have software, but to most CFOs it’s no surprise. As we discovered in this year’s CFO IT Survey, many finance chiefs have a very level-headed view of technology: they’re fully aware that it often raises as many problems as it solves. CFO’s fourth annual IT survey, conducted in early January by CFO Research, garnered responses from 203 finance executives. Almost 30% of respondents were chief financial officers. Another 25% were controllers and 16% directors of finance; 9% were either a managing director, president, or CEO. How does this population feel about technology? Finance executives don’t have their heads in the sand. 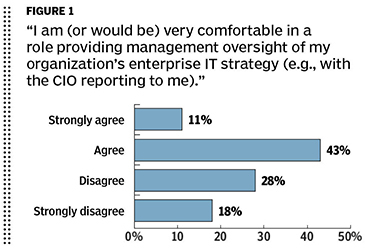 In the survey, about 77% “agreed” or “strongly agreed” with the statement that, currently, their “organization’s IT strategy is an essential component of [its] growth strategy.” Only 22% disagreed with that statement. But many finance executives are leerier, viewing technology as “a never-ending learning curve in that both hardware and software [are] constantly being upgraded at significant expense,” as one respondent put it. Or, in a more traditional finance view, technology is “a difficult cost to manage effectively,” said one CFO. As skeptical as many finance chiefs might be, they have a clear-eyed view on the requisite technology know-how for future CFOs. About 90% “agreed” or “strongly agreed” that the CFO of the future will require a much stronger technology skill set than is presently required of CFOs. However, only about half of respondents took any specific actions to upgrade their technology expertise in 2017 (slightly more, 57%, plan to do so in 2018). 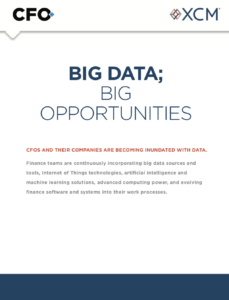 Is it enough for a CFO or an enterprise just to stay current with the latest technologies? Jeff Thomson, CEO of the Institute of Management Accountants, falls in the camp that thinks CFOs should be thinking more innovatively. If finance and accounting teams “don’t step up to advanced analytical competencies, in data science and things of that sort, 10 or 20 years out they could easily lose their relevance in the modern enterprise,” says Thomson. But there was another risk that this group of finance executives was acutely aware of: technology adoption’s effect on those in the trenches. In some ways, this may be connected to many of these CFOs’ personal orientations toward IT: tech enthusiasts rarely have full recognition of the human costs of digital disruption. 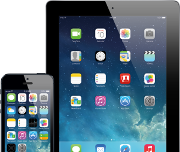 Many of the CFOs surveyed, in contrast, were fully aware that getting users (finance staff and others) on board with change is of paramount importance. 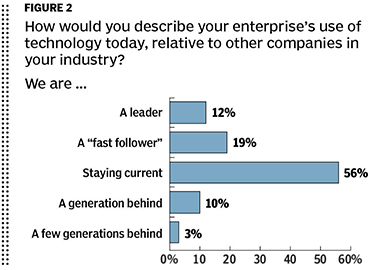 In addition, the finance executives surveyed had high expectations of their technology investments this year. 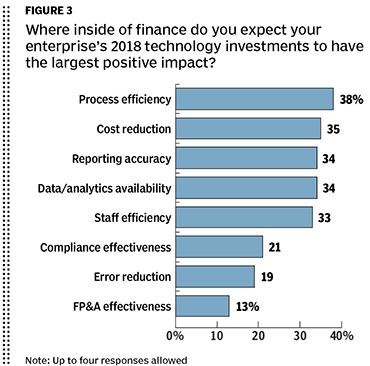 Inside of finance, they expect the largest positive impacts in the areas of process efficiency (38%), followed closely by cost reduction (35%), reporting accuracy (34%), and data/analytics availability (34%). Compliance effectiveness and error reduction fell further down the list. Process efficiency and cost reduction are what Thomson calls “table stakes” for today’s CFO. “Those are things that organizations are expected to have honed by now,” he says. However, the reality is that organizations are burdened with legacy systems, and can’t just “flip a switch” and be migrated to the latest tools and software that provide cutting-edge process automation, he notes. Outside of finance, CFOs should be looking for tech investments that are competitive differentiators, explains Thomson. What differentiates CFOs and companies is investing in “activities that could be a little bit of a bet, but could actually propel the organization’s growth beyond its run rate,” he says. Finance chiefs may be a few years away from achieving the dream of the digital CFO, but that may be OK if their organizations are investing in the tools that will be needed in the digital era. Companies need leaders of innovation, for sure, but they also need executive team members that ensure tech investments deliver value.